Bonds got clobbered today, going in the opposite direction as stocks. 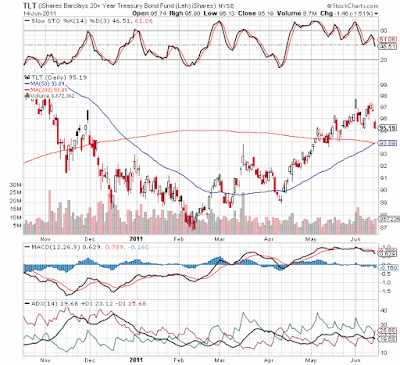 Over the last couple of weeks, Slow Stochastics have been trending down while TLT was trending up. This implies TLT was running out of steam. Slow Stochastics have broken down in a bearish manner now with the value dropping below 50. 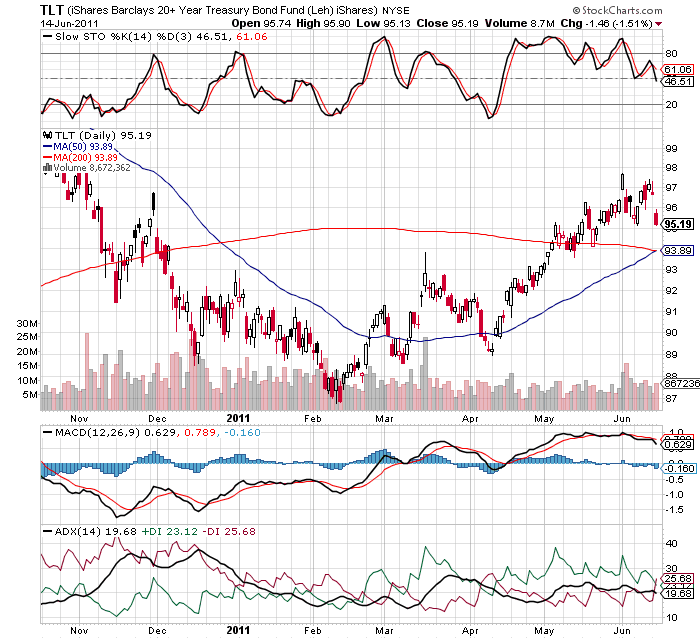 MACD has also been trending down slightly while TLT was trending up. MACD has now failed to climb above its signal line (the red line) for a couple of weeks and, after today, is noticeably pointed downward. Also not shown, Williams %R has dropped like a rock and is actually showing an oversold condition already! So from a technical point of view, it appears that the steep up-trend has been interrupted. The indicators discussed above suggest there is further downside. The end of QE2 - losing the Fed as a buyer of bonds is something the bond market seemed to have shrugged off. Now that the date is drawing closer maybe bond investors are getting nervous. The game of chicken being played in Washington regarding raising the debt limit - no one seemed to be concerned about this either but now, as the the weeks pass and progress seems to be minimal, this could be another reason for Treasury bond investor skittishness. Economic data out of China today was upbeat, suggesting that the global economy may have a few breaths of life left in it after all. Similarly, retail sales data today for the U.S. were not horrible, as the bears expected, but were actually decent ex autos. In the face of what might turn out to be a resurgent economy, the puny yields on bonds (and perceived safety of Treasuries) are perhaps not worth the price of missing a rally in equities. Some might say that we simply saw another simple Risk On/Risk Off knee-jerk reaction today like we have seen so often during the last year where stocks rally and bonds falter and vice versa. On the other hand, there are signs that maybe something more is at work here.